I Have Seen The HFR Future, And It Is Good. As long time readers will know I’ve got a bit of thing for the technology of recording pictures both of the still kind in the form of photography and, more recently, in that of the cinema. I was truly fascinated by the amount of work that James Cameron put into creating Avatar as in the past 3D had simply been a gimmick used for attractions at amusement parks and not something for serious cinema. I feel like Avatar changed that (although I do admit that it’s been heavily misused since then) as it opened up 3D as being another tool in the director’s cinematography kit, one that can be used to great effect. Indeed apart from Avatar and TRON: Legacy, both films designed to be visual masterpieces, there hadn’t been any movies that I felt used it to proper effect. There were many where it was inappropriate (Hot Tub Time Machine anyone?) and some where it didn’t add nor subtract anything (Dredd comes to mind) but there wasn’t any that I felt took that careful, considered approach to ensure that the 3D was used appropriately. That was until I saw this video from the production set of The Hobbit: An Unexpected Journey. Whilst I’m sure not everyone will find that video as enthralling as I did the short of it is that the 3D rigs that were used in the filming of The Hobbit are essentially unique in their design as they set out to do things that no movie had ever done before. Primarily this was because they didn’t go with more traditional 3D cameras which have specially designed lenses and sensors in order to do 3D. Instead they were using RED EPICs a camera capable of delivering resolutions up to 5K and, more importantly, at a frame rate twice that of traditional cinema. These cameras then required special rigs in order to get the 3D effect right which were marvels of engineering in and of themselves. I had been drooling over the camera set up for a long time and finally managed to see the final results on Saturday. Now I was a bit worried about what I was about to see as many film critics had said awful, awful things about how HFR had ruined the entire experience for them and since I had broken my rule of avoiding the hype my expectations were much higher than they normally are. It got worse when I got to the cinema and I was handed a pair of polarized 3D glasses rather than the active-shutter ones I thought they would use but I didn’t let that phase me and settled in for the next 3 hours. What followed blew even my fan boy level expectations out of the water. You’d be forgiven for thinking that the above still was a retouched shot (done solely for the promos) but the entire movie is like that, drenched in luscious colour and with incredible amounts of detail everywhere. I will admit that the 48FPS takes a little getting used to thanks to its prevalence in the cheaper forms of media elsewhere but for things like wide open panoramas and dialogue scenes it’s something that you’ve just got to see in person. It’s not perfect yet as some of the green screened sections didn’t feel quite right but Peter Jackson really is onto something here and I’m sure the next 2 instalments will only improve on the original. I won’t go as far to say that this is the future of cinema however as there was an incredible amount of investment done in order to get this to work the way it did and whilst duplicating it might be cheaper thanks to The Hobbit footing the R&D bill I can’t see many wanting to take it on. Indeed I hope that it stays as esoteric as it is now as that will mean that only those who want to invest the time in doing HFR 3D right will attempt to do so, rather than the rampant band wagoning we saw after Avatar premiered. 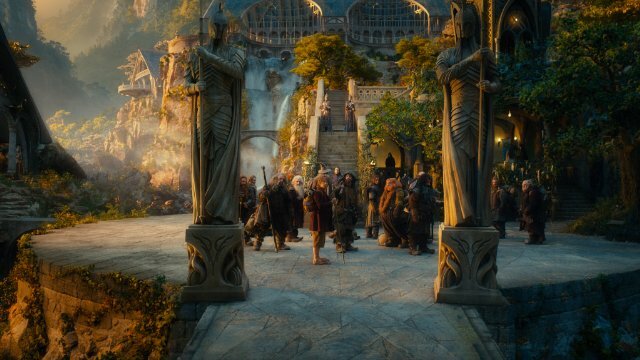 With all that said it should come as no surprise that I recommend you see The Hobbit and do so in HFR 3D as that was the way it was intended to be seen.